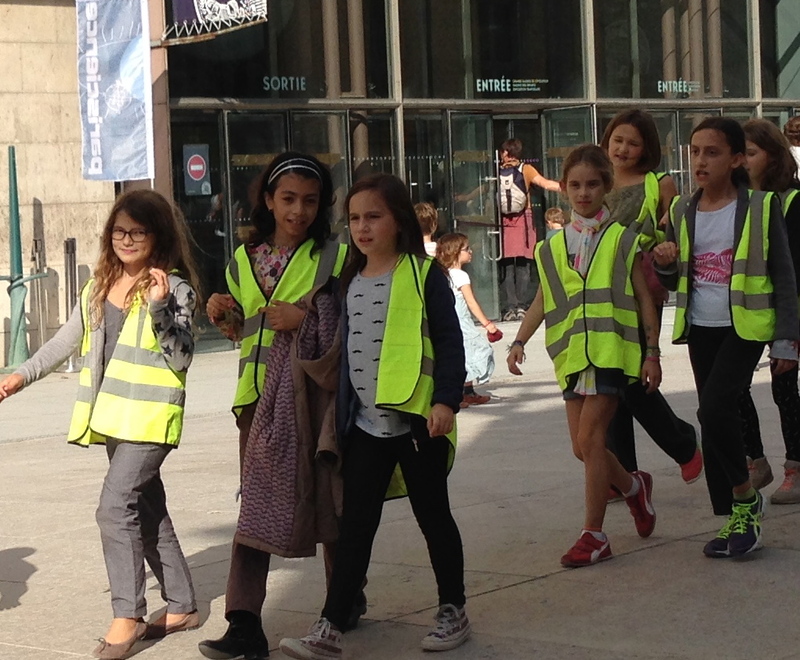 Paris is the high fashion capital of the world, but Parisians, while influenced by the runway, have their own ideas about fashion. These seem based on group consensus, and if you don’t follow these parameters you simply are not stylish, at least not in the Parisian way. There is a certain sameness to dressing here that might seem a bit dull if you prefer a more creative or experimental style, but there is no denying that in the end it always looks elegant. There is creativity in the way the outfits are put together and the small details. 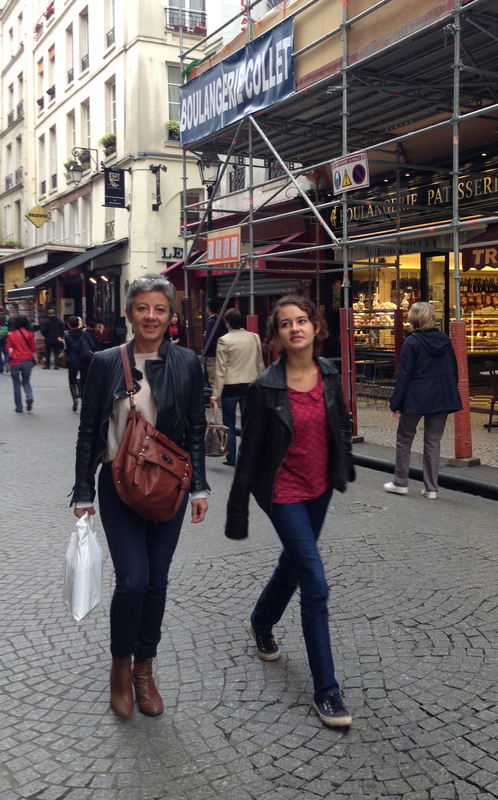 What is the Parisian way? Understated – Newscasters occasionally wear bright colors, but the general population of stylish Parisians is quietly elegant and neutrals reign. Hair is very casual, cut nicely whether straight or curly, but not remarkable. Make up is subtly applied and natural-looking. The occasional red lip I saw last winter is not around this fall. 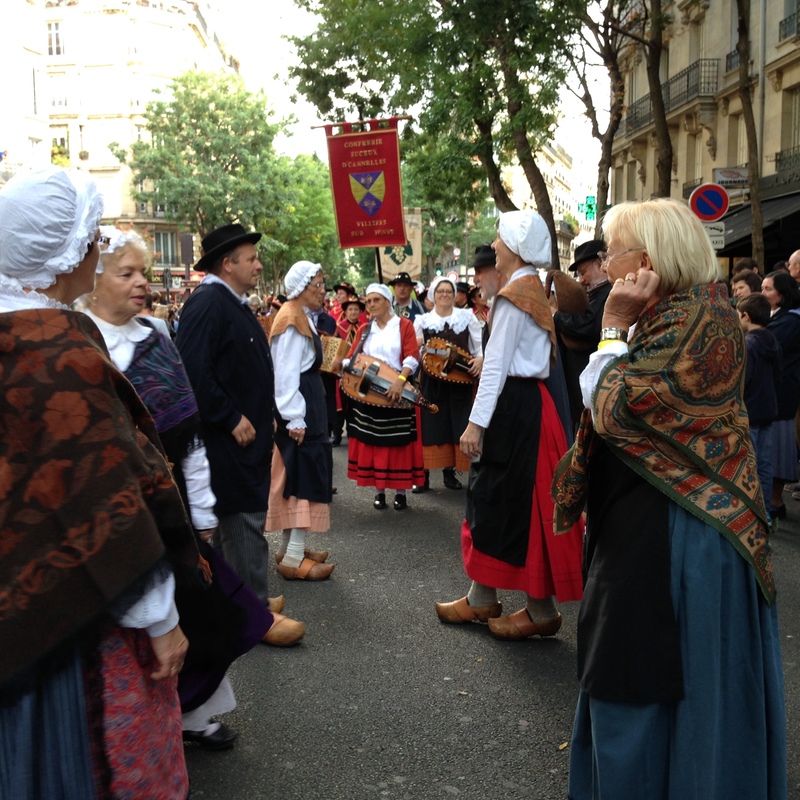 Women do wear make-up though, contrary to lore about French women not needing or wearing it. The largest Sephora store I have ever visited is located here, so clearly Parisan women are buying and wearing makeup. This is a classic Parisian look. Simple hair, high quality fabrics, a change of shoes and jewelry and she’s ready for an evening out. Uniform – In the fall, a black leather motojacket, jeans and boots is de rigeur. This uniform is worn by women of all ages. It is ok to wear a brown or tan leather jacket, but black is by far the most common as it is considered the most versatile color. For casual wear, men wear the same outfit. The man’s version of the uniform – the white jeans are a bit trendy, blue is more common. Men and women dress alike in the uniform. Same uniform, but boy does she know how to accessorize! Classic – Alternatives to the uniform include a trench coat in black or beige. There is no other style of raincoat. You can do all kinds of interesting things to your trench coat like roll up the sleeves, leave it open, leave it open but tie the belt (never ever buckle the belt!) or remove the belt. No belt looks odd to me but I have seen it often enough I believe this is a deliberate choice, not just a lost belt. If there is a chill in the air, wool coats appear and they are nice ones at that, beautifully cut in black or tan. I have seen a few colored coats in the stores, but not actually worn. Quilted jackets are also common on cooler days. Pretty black coat and everybody’s favorite accessory, the iPhone. 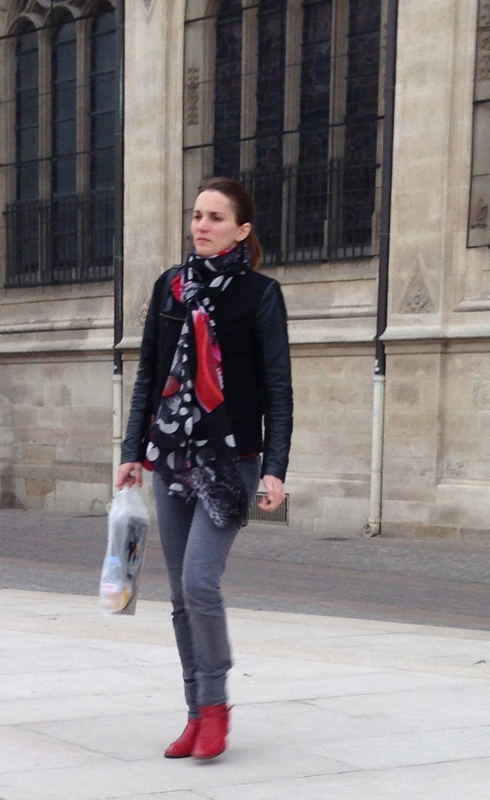 Accessorized – rare is the man or woman without a scarf. Men wear scarves in muted colors or simple patterns like herringbone or plaid. They tie them one of two ways – using the classic Euro loop or, looping the scarf around the neck one time so the two ends hang down in the front. For women, the sky is the limit for both color, pattern and tying methods. The big “neck brace” tie, in which the scarf is looped high up on the neck and shoulders seems popular this year, although certainly many other styles of scarf tying are used. Shoes here are really attractive. Many are made in Spain, Italy and France, and some in China. The shoes and boots do much to elevate very simple outfits. 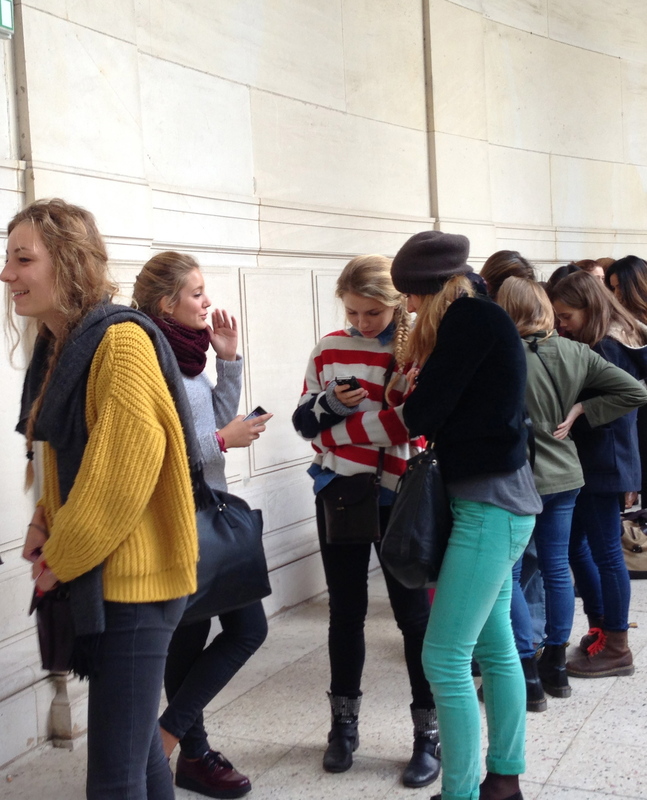 Selectively Trendy – Long, cozy, loose sweaters of all kinds, often worn with scarves, have been embraced by Parisians. On the other hand, while the runways are showing all kinds of widths and lengths of pants, the straight, tight skinny jean still predominates here, at least for fall. Loose sweaters and tops with slim pants are popular. Mom models long, cozy sweater, kids in blue jean jackets. Bicycling is a very popular way to get around town, and you must do this wearing just your regular clothes –no spandex allowed! 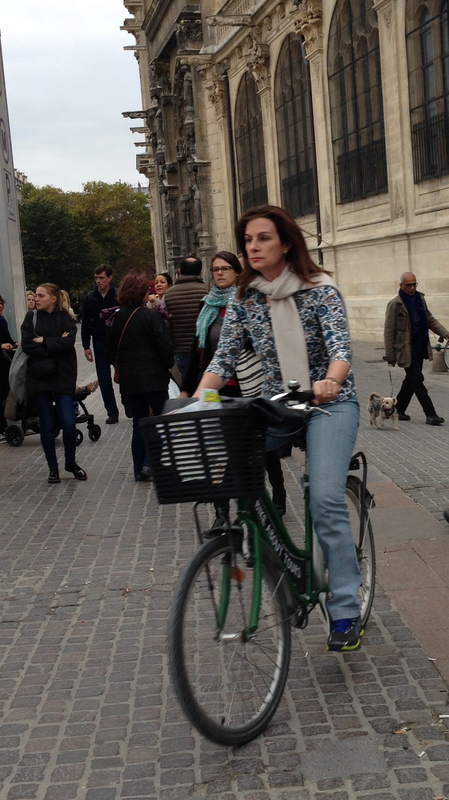 There are also no helmets worn, which makes me cringe as the traffic here is very heavy-but that’s the Parisian way! Wear your regular clothes to bike. Keeping your dashing white scarf out of the spokes is the sign of a real athlete. 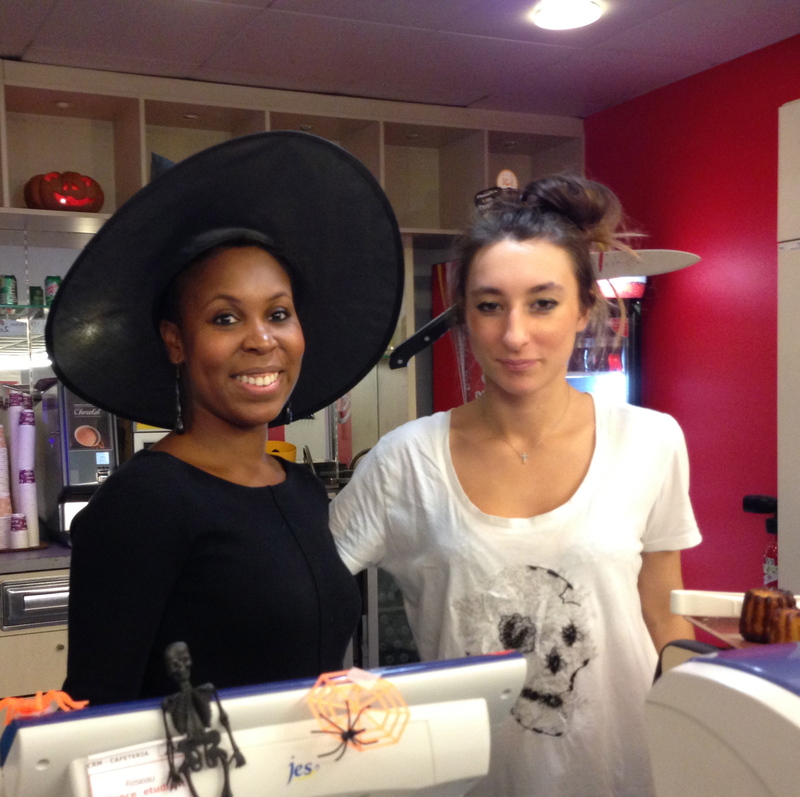 Finally, here are the lovely ladies at the Alliance Française café modeling October’s most haute couture. This entry was posted in Uncategorized on October 29, 2014 by Chrissygirl100. 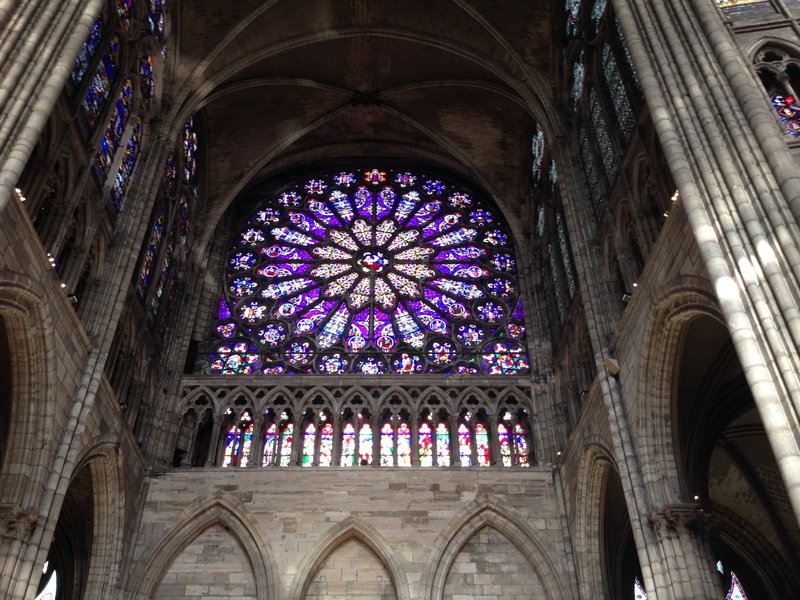 Each individual’s experience of Paris should be unique and special, so I hesitate to suggest anything you “must see.” However, the ancient cathedral described below is one that is often neglected, yet I would choose to see it before Notre Dame. At the other end of the spectrum, Frank Gehry’s new Fondation Louis Vuitton is an exceptional contribution of modern architecture that stands equally with the glorious historic buildings in Paris. 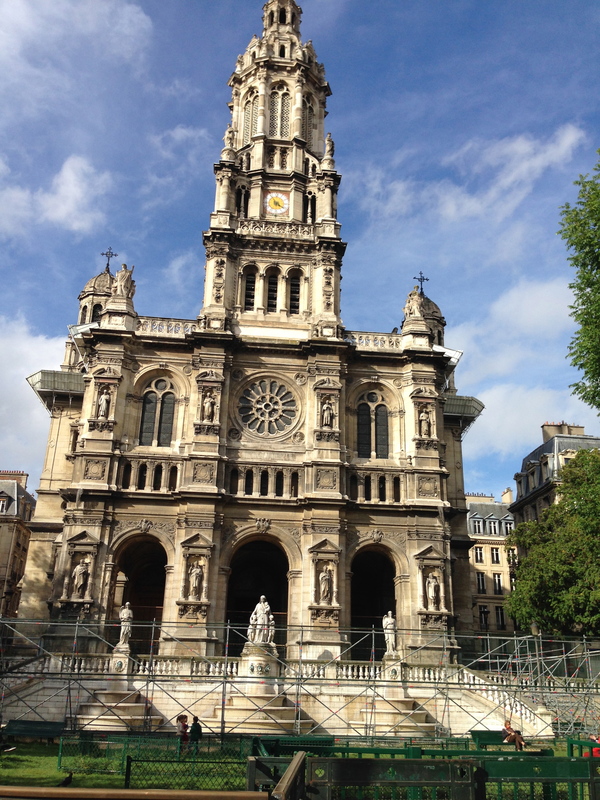 Ina Caro’s book, “Paris to the Past” inspired me to explore this amazing church not usually featured in guidebooks. I wish I had visited sooner. 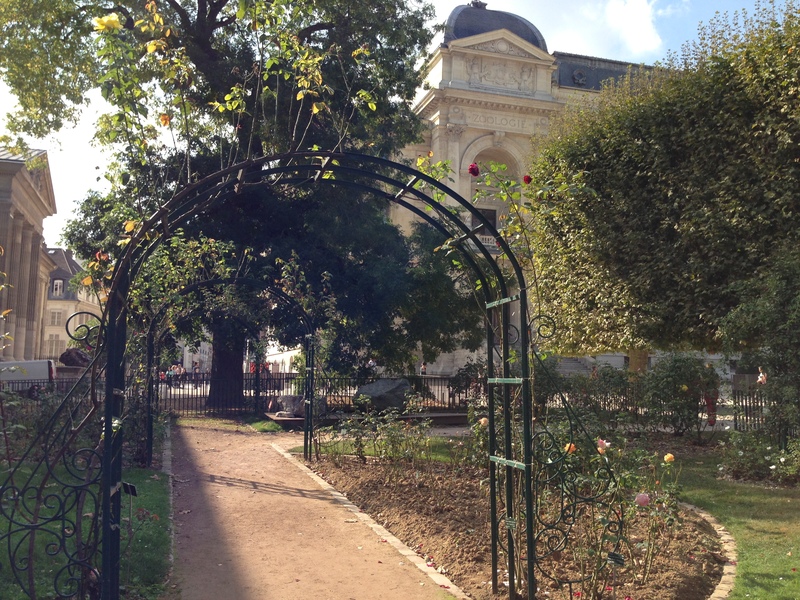 It is an excellent introduction to many of the other historic sites in Paris or France, since it is older than most of those, and the kings and queens who are buried here you will hear mentioned again when you tour other locales. 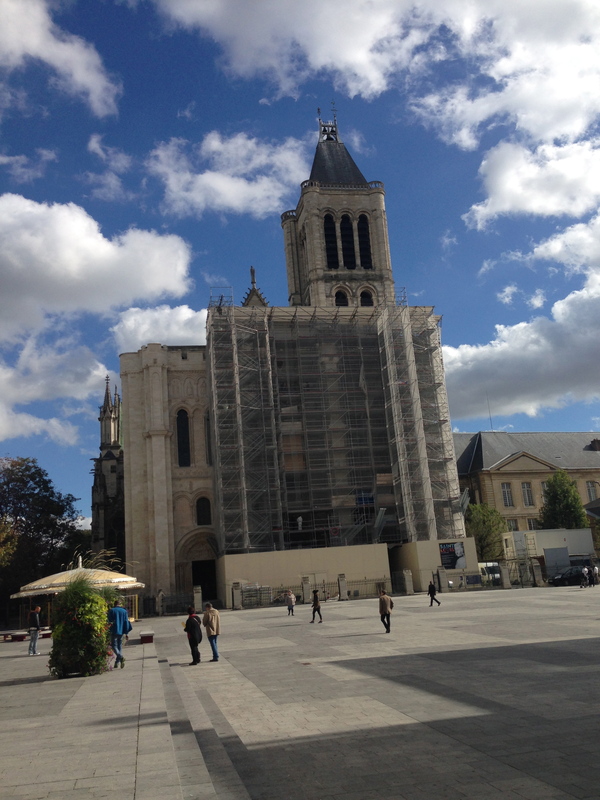 Located a 20 minute subway ride from the center of town, this cathedral is the burial place of all the French rulers. It is also the first Gothic building in the world and influenced the design of other, later churches, including Notre Dame. 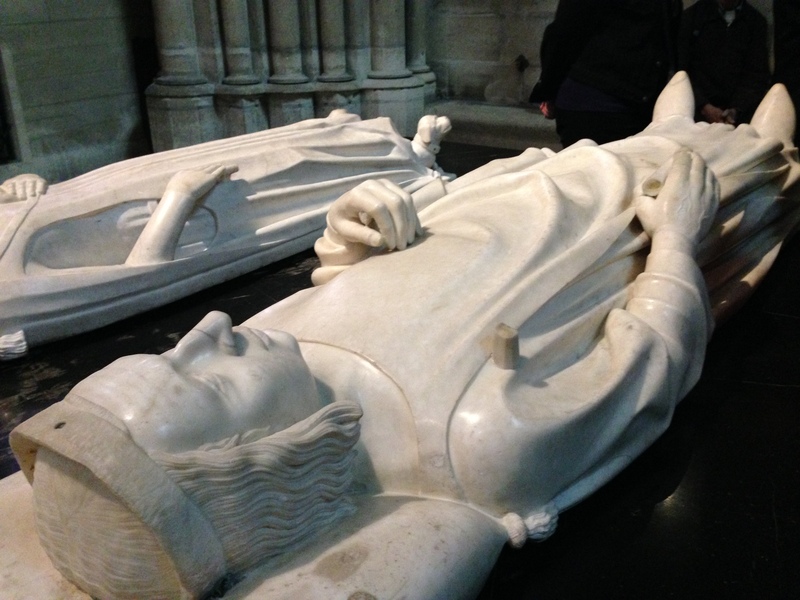 There are 42 kings, 32 queens and 63 princes and princesses buried in St. Denis. Their remains, originally placed in tombs with their recumbent sculptures, were put into two mass graves outside the church during the French Revolution. Later the mass graves were dug up, but it was impossible to identify which remains belonged to which person, so they are now all in one grave in St. Denis with a plaque listing their names. The original tombs are still in the church and most are undamaged. You can visit the church at no charge – it remains a place of worship. However, pay the 8 euros or so to visit the crypt. This allows you to get close to the sculptures on the tombs, which is key to grasping the age and history of this church. For example, in the middle ages the art of portraiture had not developed and this is apparent in some of the sculptures. Earlier kings and queens are portrayed at age 23, the age Christ was believed to have died, and their features are idealized and not their own. It is only later sculptures that start to more accurately resemble their subjects. 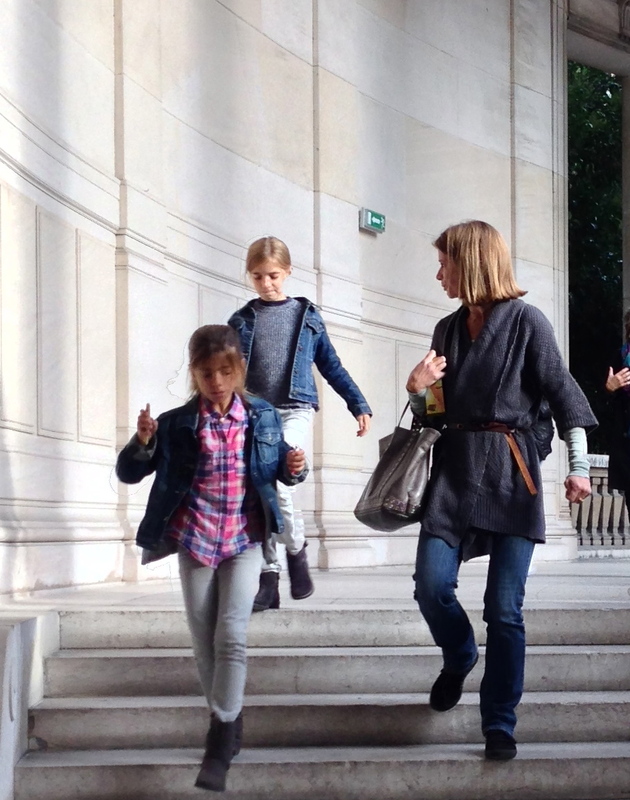 If you speak French, schedule your visit so you can take the guided tour offered twice a day at no additional charge. 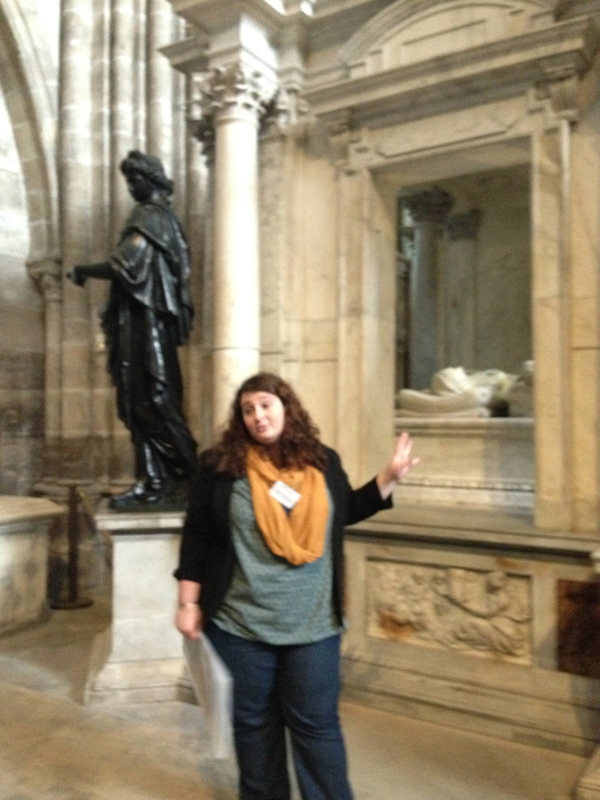 My guide was outstanding – in a two hour presentation without notes she shared the history of France as reflected in the art and architecture of St. Denis. Unfortunately, there is no tour offered in English. There is an audioguide on the cathedral’s website but it’s fairly superficial. I would recommend reading the first chapter of Caro’s book, or reading a book about the cathedral itself to make the most of your visit. Our excellent guide discusses the latest, Renaissance tomb. It is the size of a Paris apartment! 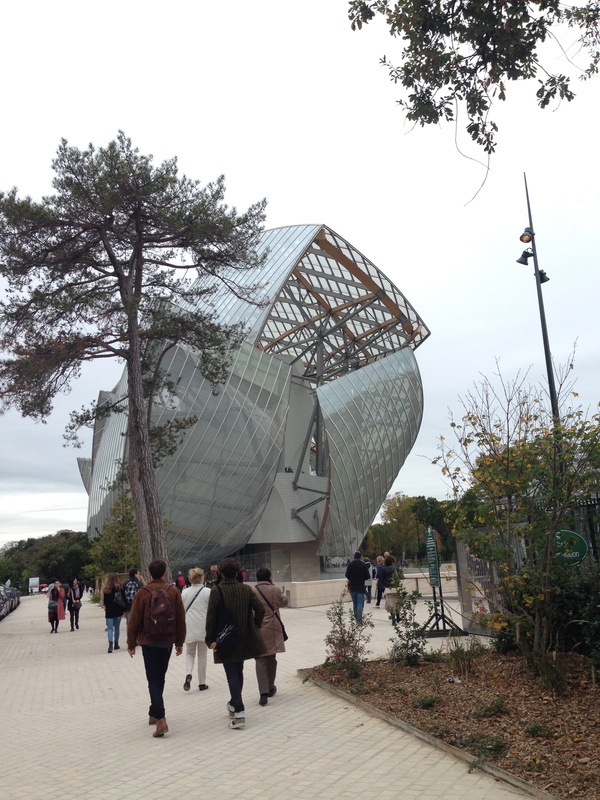 Paris’s newest museum designed by American/Canadian architect Frank Gehry opened this weekend. Like all of this great innovator’s work, this space is unique and so striking you should plan to spend a couple hours just walking around and exploring. 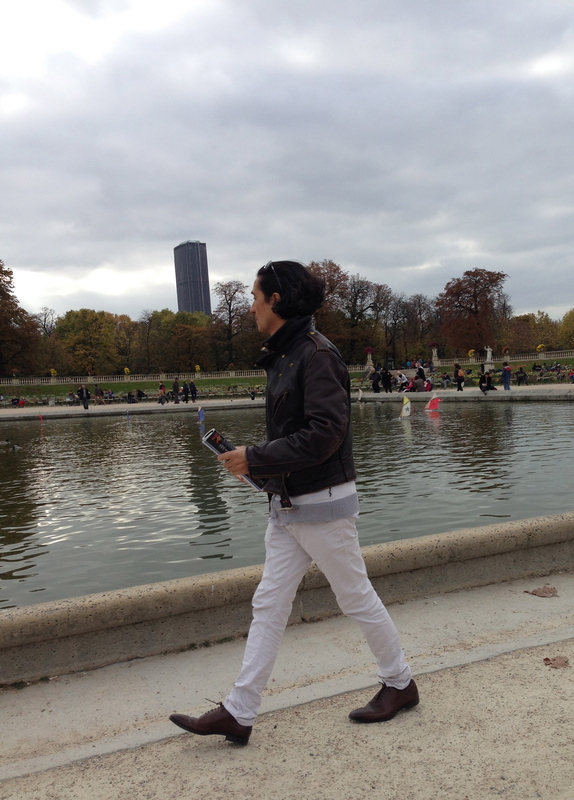 The building is shaped like a boat, and appears to be sailing in the middle of the Bois de Boulogne park, where it is located. 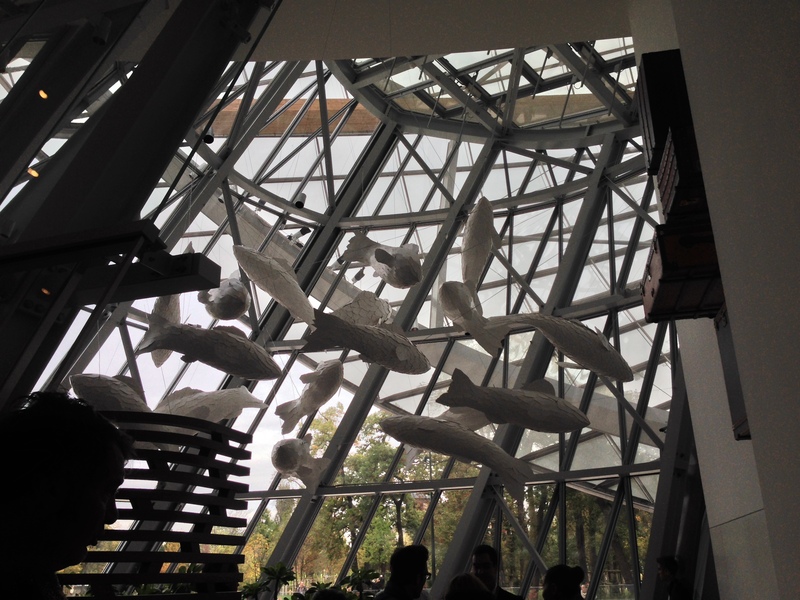 I particularly liked the use of water in the design, and I noticed many visitors enjoying the fish that are suspended over the café area of the museum. 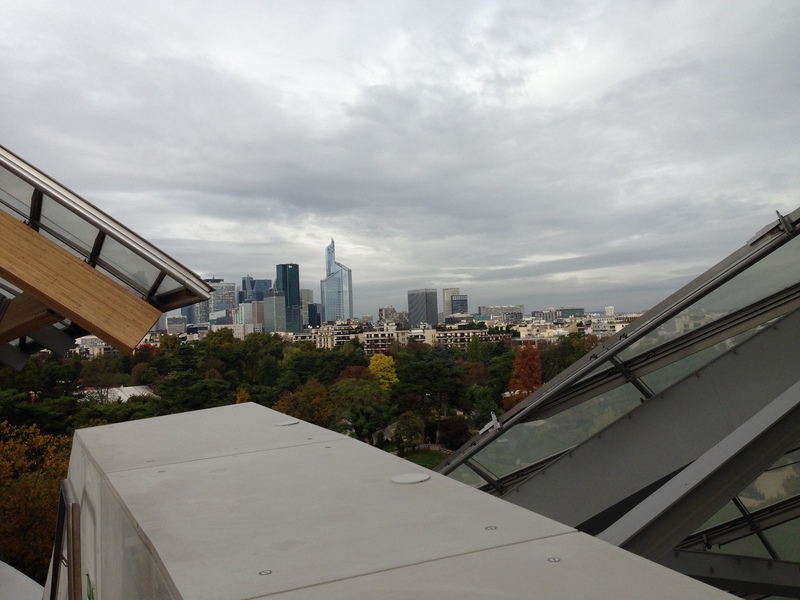 Photographers will love the beautiful views of Paris from the terraces of the building. The building is indeed a magnificent work of art, but it isn’t the least stodgy, as you might expect a grand space to be. It feels playful and uplifting. There were quite a few children enjoying it on opening day. They were very excited to visit the giant boat in the park! This entry was posted in Uncategorized on October 25, 2014 by Chrissygirl100. Update on Locks on the Bridges – What a Mess! What may have seemed like a sweet idea has gotten out of hand. 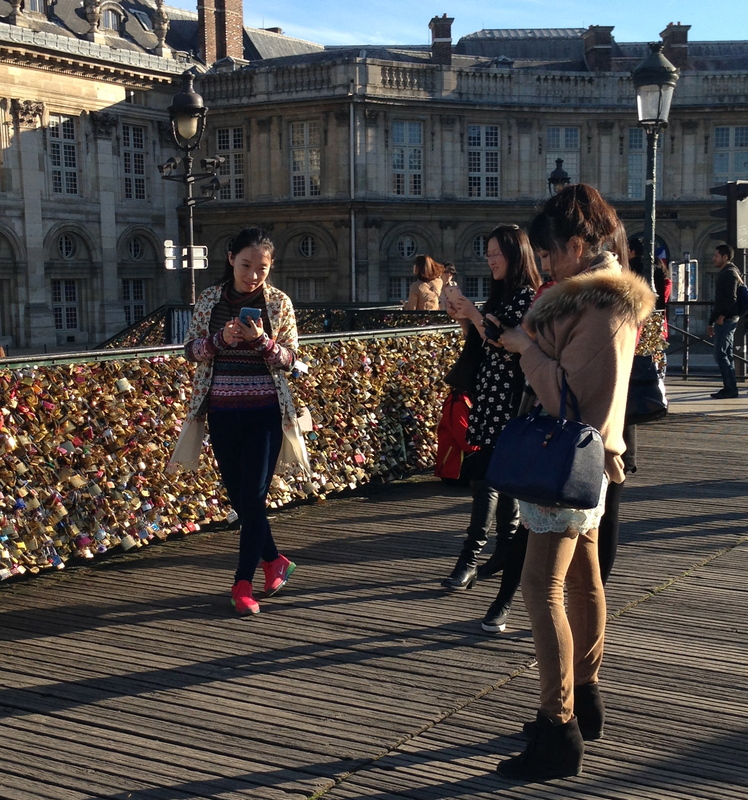 The locks loving couples hang on bridges and other monuments in Paris are becoming destructive. 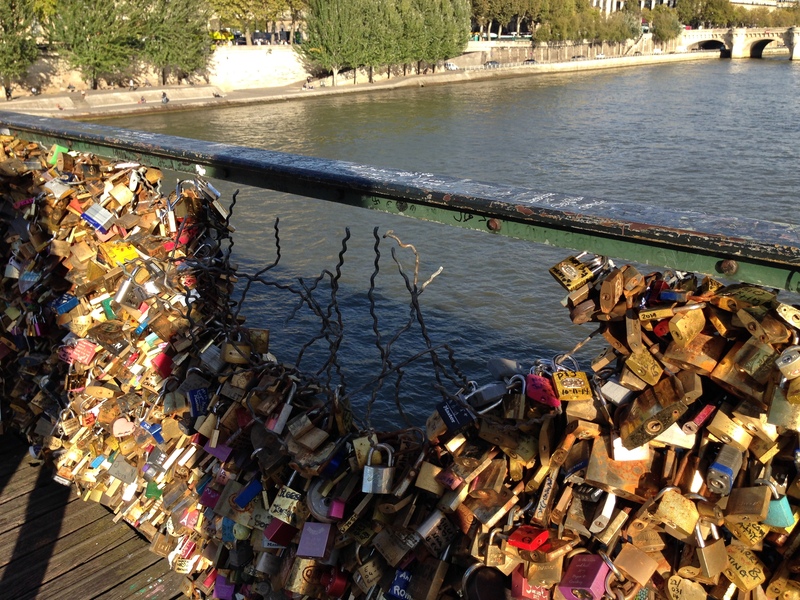 If you haven’t seen these, typically a lock on which the couple writes their names with pen or markers is clipped to a bridge railing and the key thrown in the river. 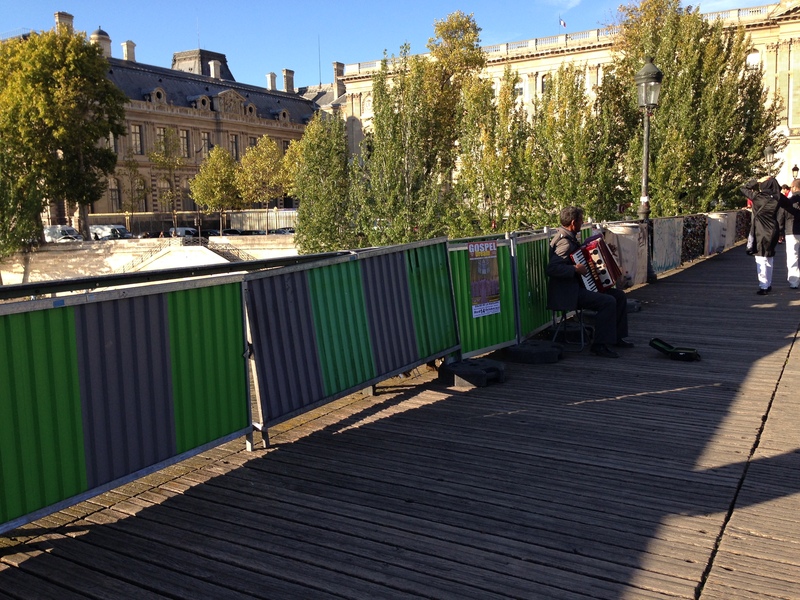 On the Pont des Arts the weight of thousands of locks has finally broken the railings on the bridge. Now there are a variety of barriers in front of the railings to prevent the addition of more locks. These have been decorated with graffiti. 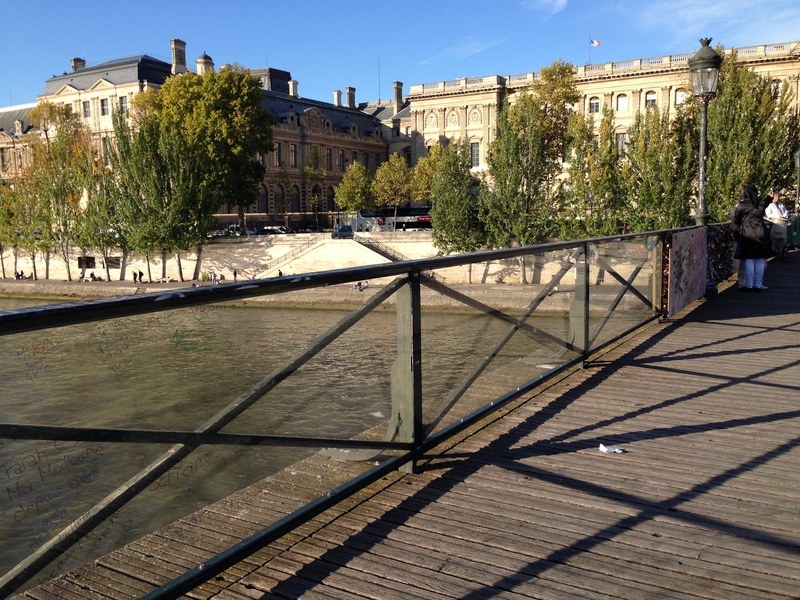 There is one section of the Pont des Arts where the city is experimenting with a style of railing to which it is impossible to attach locks. It, too, has graffiti on it, but they are not that noticeable. Le Printemps is one of the big department stores in the 9th arrondissement, and it has the nicest public bathroom I have ever visited. I was a little startled at first, because it costs a minimum of 1.50 Euros to use it. However, for that price an attendant cleans one of the very modern toilet cabins (they are nicer than stalls) for your personal use just before you enter. A higher fee buys a visit to a more luxurious bathroom. Check it out if you are ever in town and need the “facilities.” The bathrooms are on the first floor of the department store (American second floor) so they are fairly conveniently located. 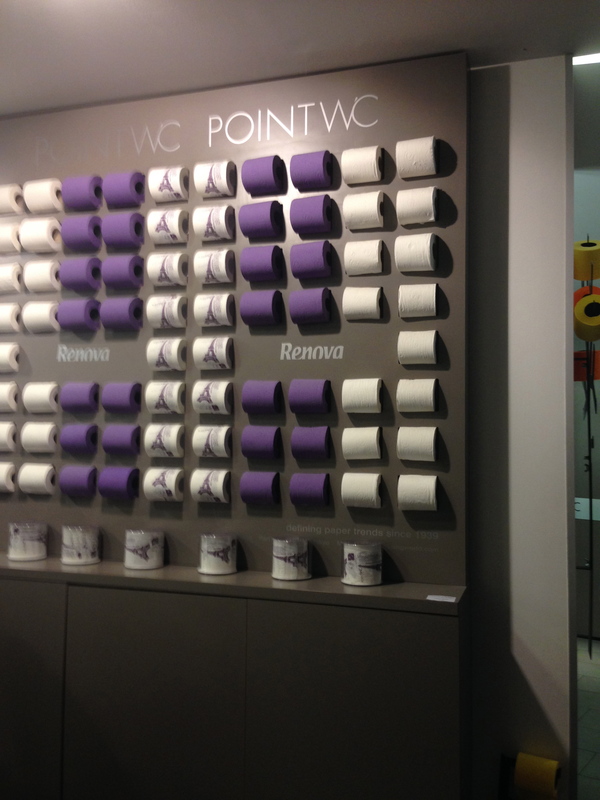 Should you be looking for that special souvenir, you can even buy toilet paper there with the Eiffel Tower printed on it! Some of the nicest encounters happen when you least expect them. 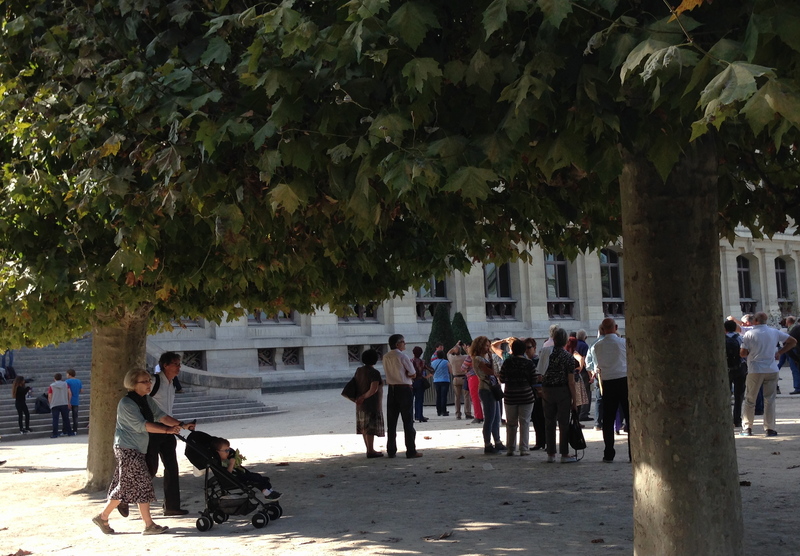 I was walking towards the big department stores in the 9th and passed the large church at Place de Trinité. On several occasions I have enjoyed an aperitif and a view of that church at one of the three bars located in that square. 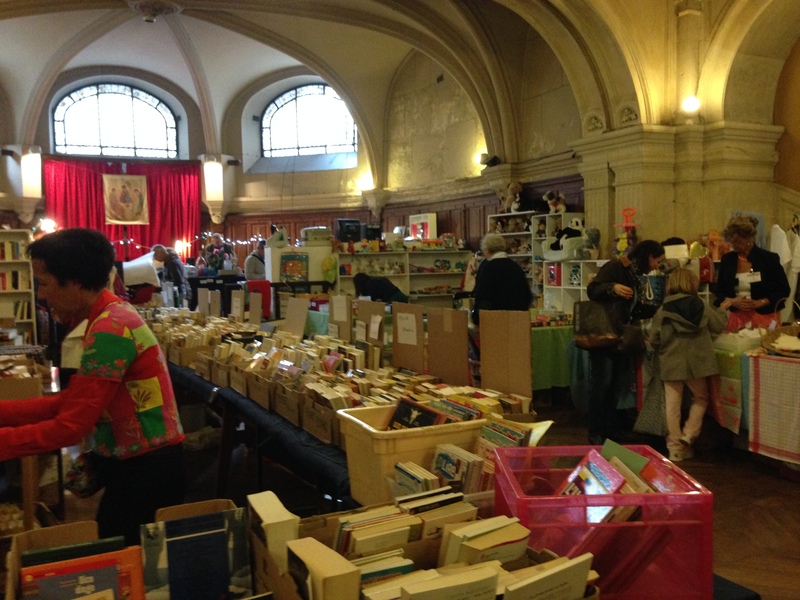 On this occasion there was a big sign on the church that said “Braderie.” I looked that word up and it means “rummage sale” – something I find hard to resist! I detoured and entered the basement of the church. 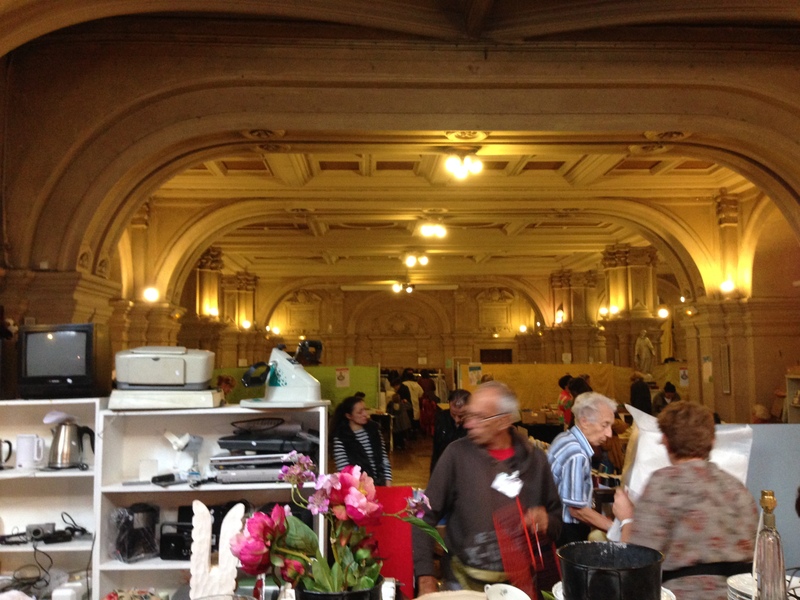 Sure enough, clothes, books, and various household gadgets you would expect at any rummage sale were in large supply. 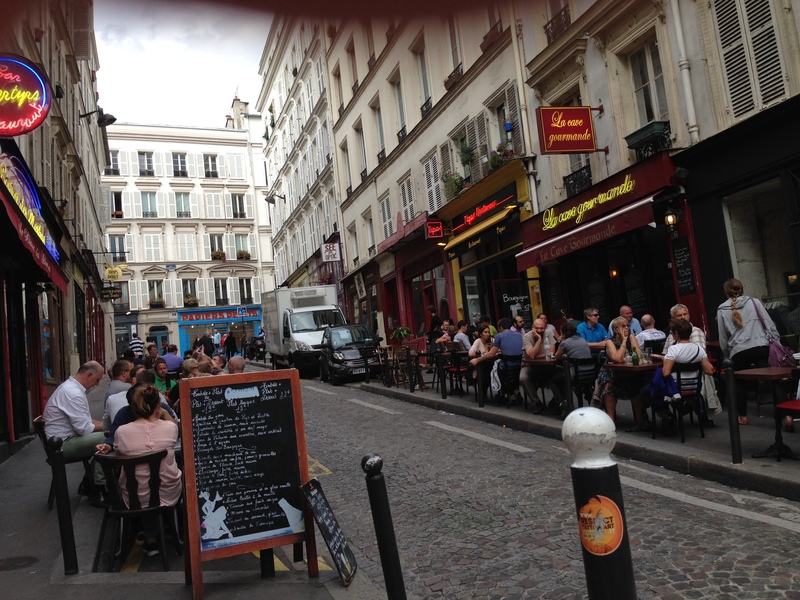 I bought four “roman policiers” for three euros – from George Simenon’s Maigret series. 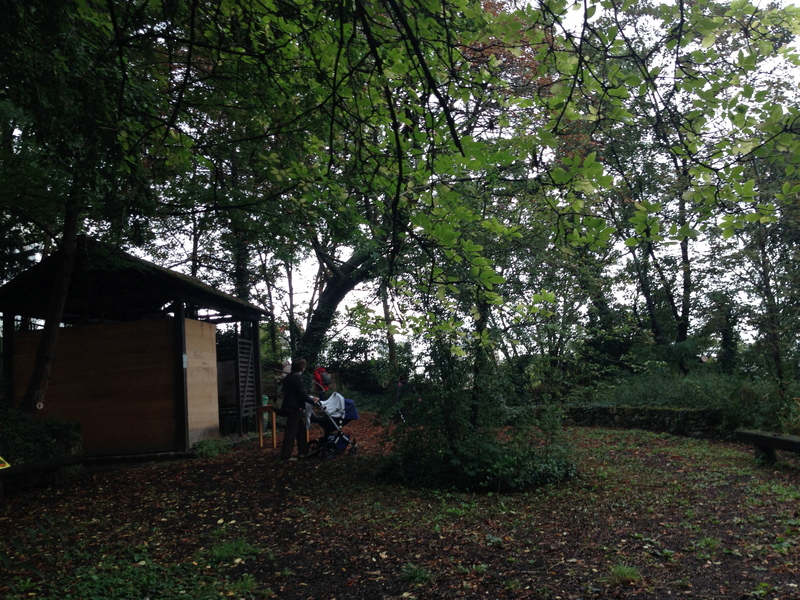 It was also a great place to practice speaking French. The volunteers at the various tables were happy to chat, and when I examined the jam displayed at one of them, the lady behind the table and I talked at length about the difficulties of jam-making – she was impressed that I have made peach jam because it’s quite labor intensive. i was impressed that I could muster up the specialized vocabulary to talk about it. 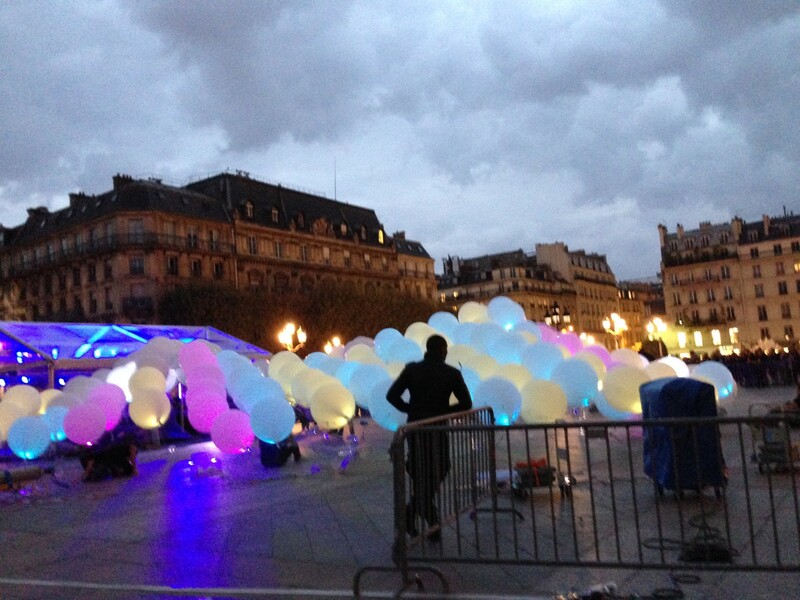 It’s the little surprises in Paris that can make your day special. This entry was posted in Uncategorized on October 20, 2014 by Chrissygirl100. 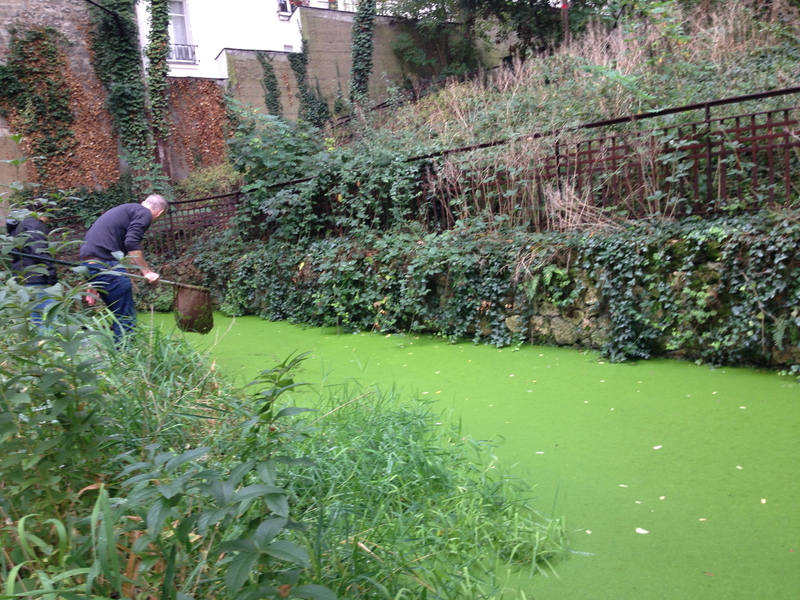 In the heart of Montmartre Paris has its own vineyard. 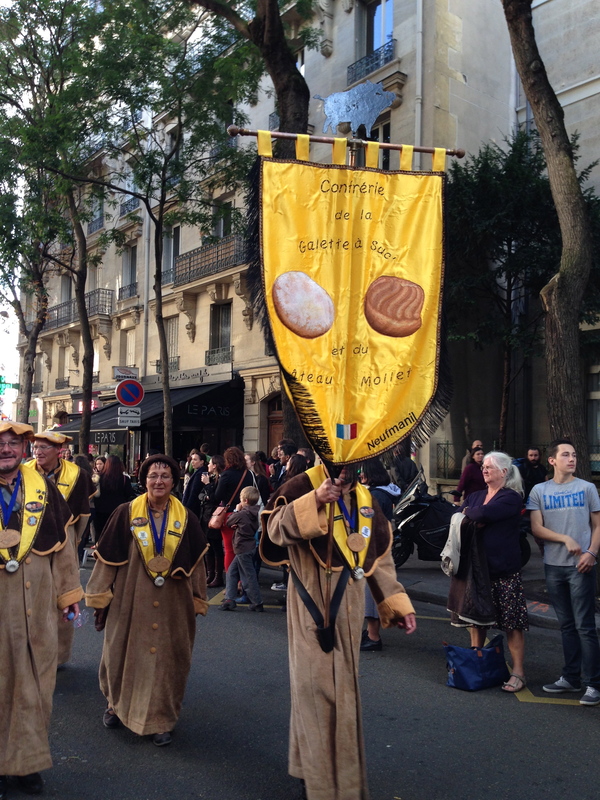 In October of every year the grape harvest is celebrated for five days in the Fête des Vendanges. I am not sure that there were any grapes in the vineyard this year. I didn’t see any, and my Parisian friends tell me it was very cold this summer so it was probably a bad year for grapes. Nevertheless, we had a lovely celebration. 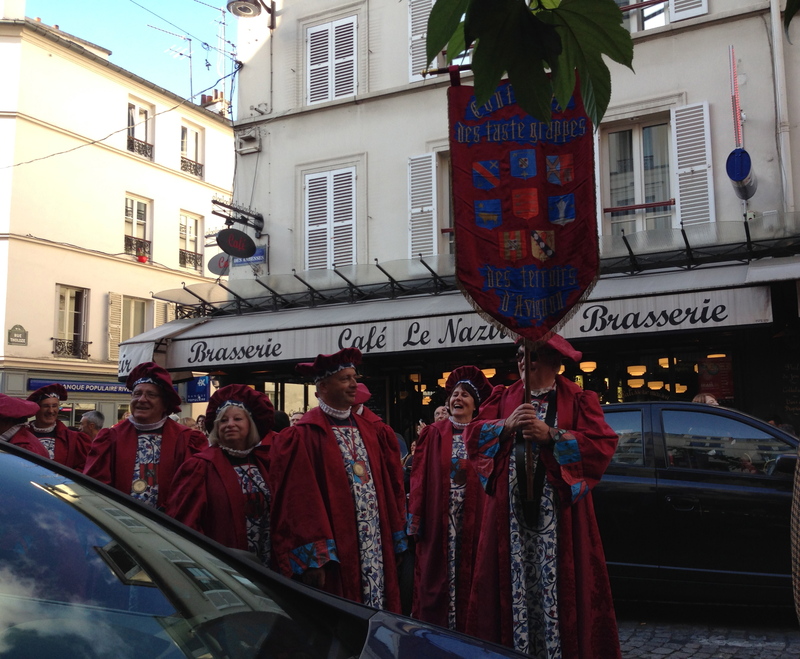 One of the highlights is the big parade that winds its way through Montmartre. 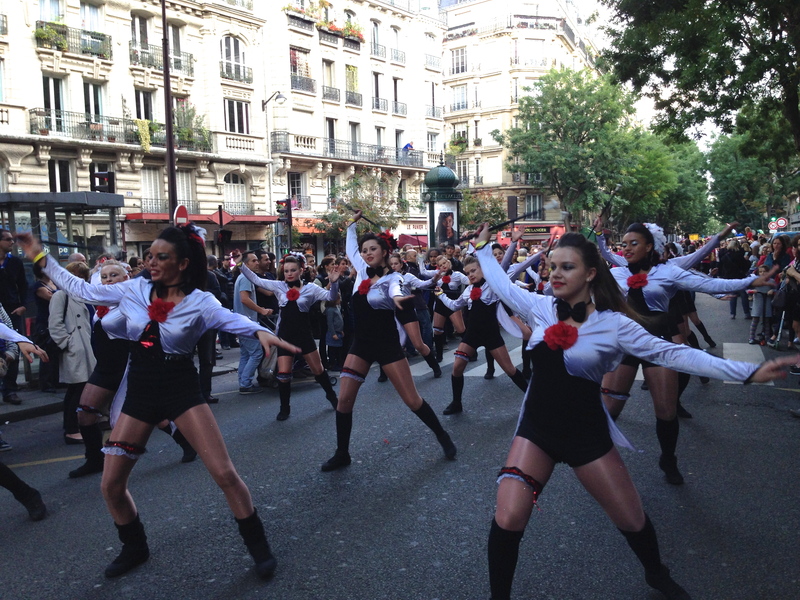 Although in Paris, the parade reminded me of small town parades I have enjoyed in Traverse City, Michigan, where any and every enthusiastic organization joins in the merriment. 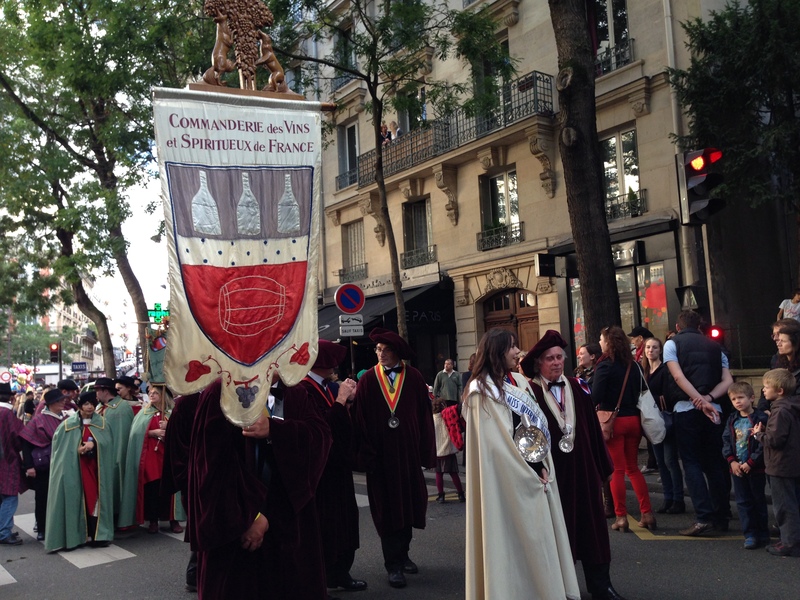 Most of the participants in “Le Grand Défilé” represented fraternities or organizations involved in some aspect of winemaking. 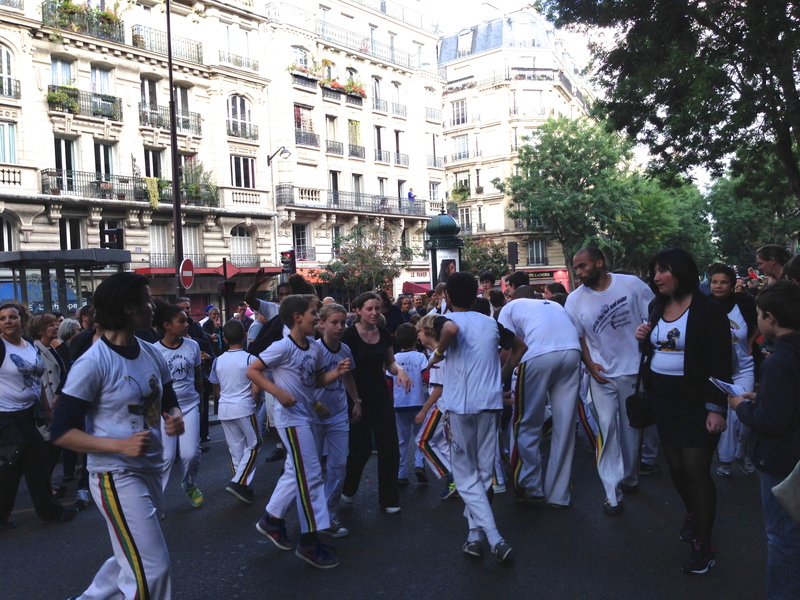 Then, there was everyone else – the students in an athletics school, a drumming group, Ukrainians in their folkloric costumes, it seems just about everybody who wanted to join the parade was welcome! 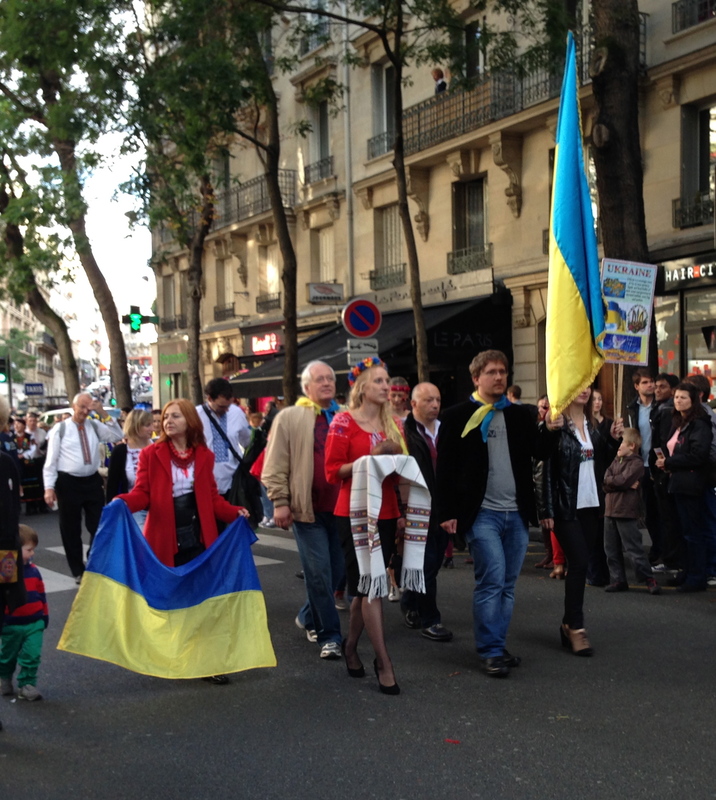 Ukrainians – they received a cheer from the crowd. We have walked a long way. That brasserie looks good! This entry was posted in Uncategorized on October 18, 2014 by Chrissygirl100. In a quiet corner of Montmartre there is a small garden, the Jardin Sauvage Saint-Vincent, open to the public only 5 days each year. One of those days was last week, so I thought I would pay a visit. The garden has been here since the 17th century, when it belonged to a mansion that was razed in the 1960’s. Today, it is kept wild, allowing the fragile ecosystem that would exist if there were no Paris to thrive. Only the trees are trimmed back occasionally, letting the understory plants have enough light to grow. The entrance to the garden is through a small metal gate that is locked most of the year. 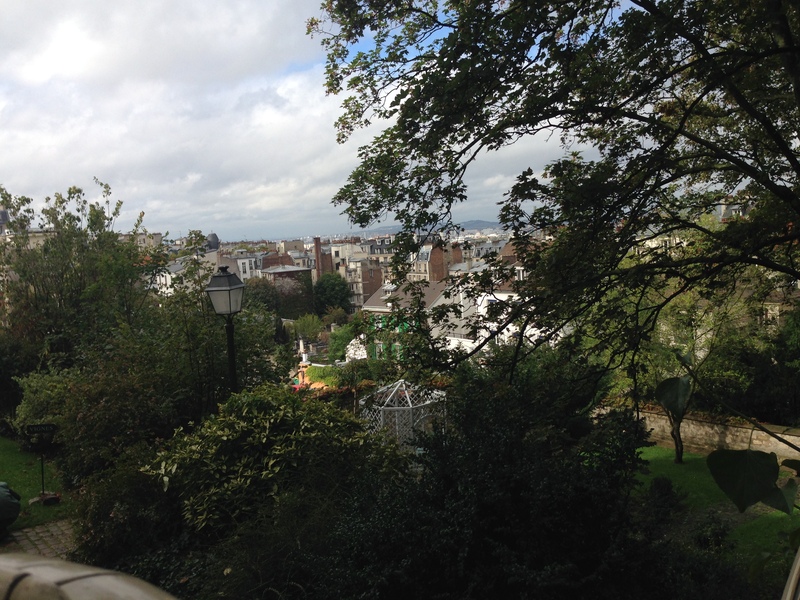 Like much of Montmartre, the garden is on a hill. There is a path of steps you must walk to reach the summit. When I entered, a young mother was attempting to ascend the path with her sleeping baby in a carriage. I offered to help her lift the carriage, and when we reached the top I told her I hoped she would make the most of her precious moments of calm while the baby slept. 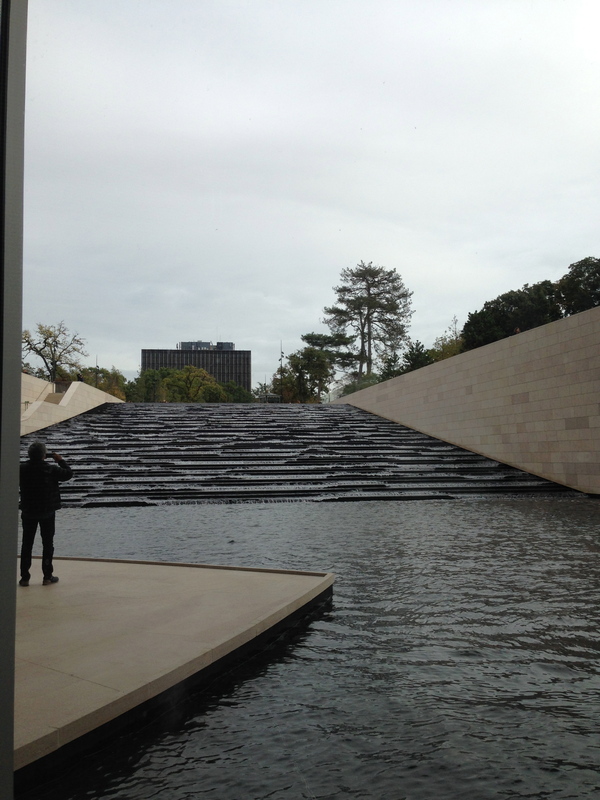 At the top of the staircase is a pond and a small walking path that makes a circuit of the park. “Park” may be too grand a word for this little sequestered spot, as it is small and still feels like the private garden it was once. The trees are tall though, and seem to absorb any nearby traffic sounds. It was extremely quiet. Other than the mother and baby, the only people present were a couple strolling the grounds, a man taking photographs, and two employees available to answer questions about the garden and taking samples of the aquatic life in the pond. 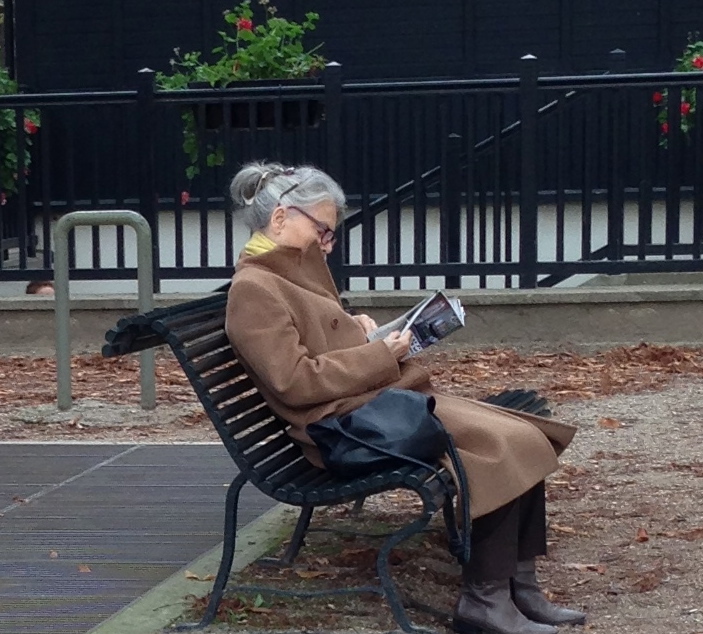 I walked the circuit, snapped some photos, and came back to the flat area where the mother was now sitting on a bench reading. I had seen all there was to see, and I had other things to do that day, but it was hard to leave. I wandered down a path and found my own little wooden bench where I rested a while, savoring for a bit longer this tiny enchanted forest in the city. 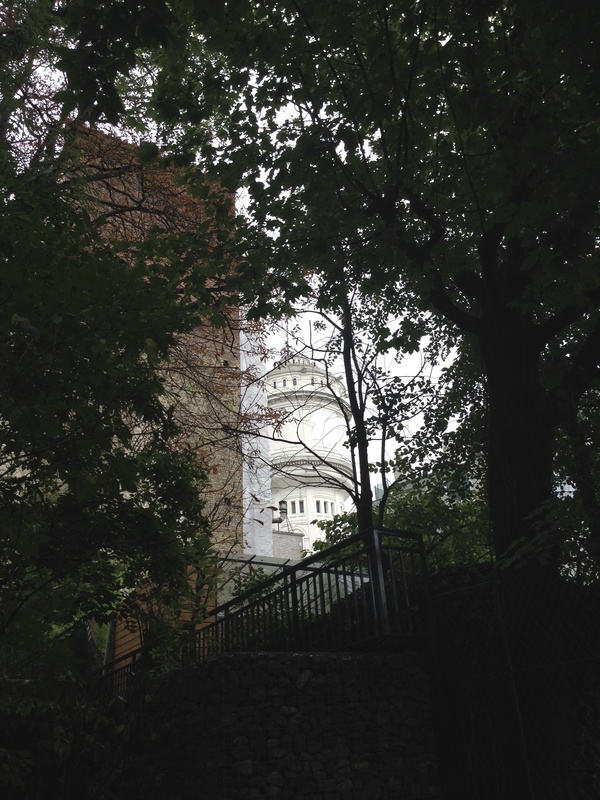 A little of the Sacre Coeur basilica seen through the trees. This entry was posted in Uncategorized on October 13, 2014 by Chrissygirl100. I wrote this post sitting by my apartment window watching the rain pour. 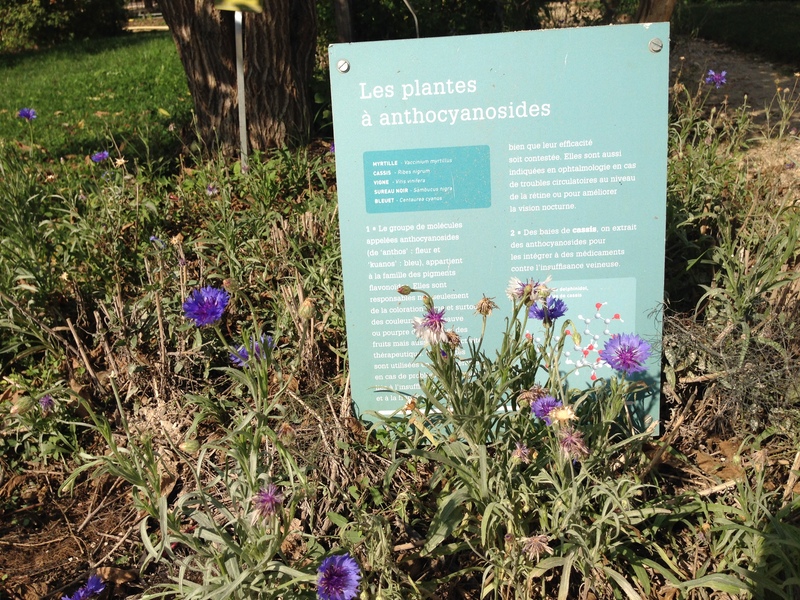 It was fun to recall my visit on a sunny day last week To Paris’s natural history park and museum, the Jardin des Plantes. 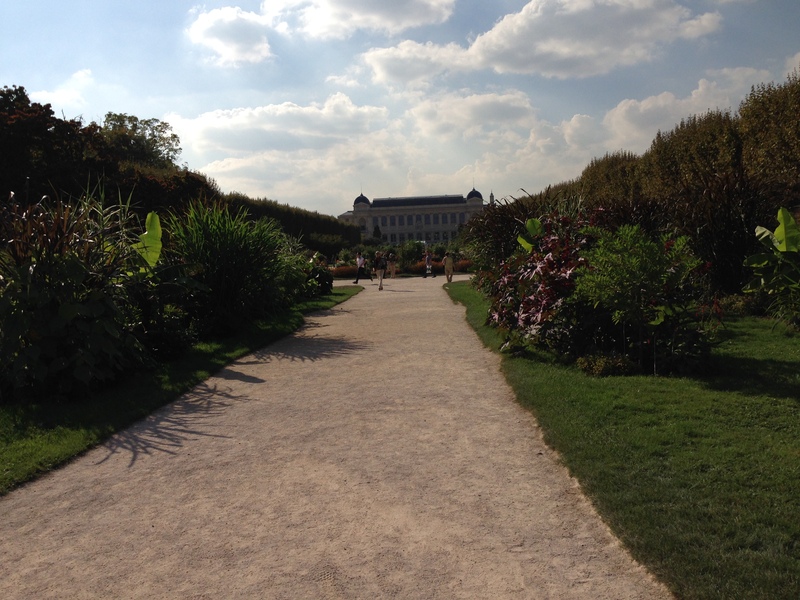 Though I intended just to walk through the garden as part of a stroll around the 5th arrondissement, instead I spent the afternoon enjoying all the park has to offer. There is a very pleasant café where you can order a “ formule” of baguette, cookie and a drink and eat your lunch at a picnic table. There is a formal rose garden, where a few blooms still remain in October, and a fascinating herbal and medicinal garden with signs indicating the many uses of the various plants. These include improving circulation and night vision, keeping the kidneys healthy, and combatting diarrhea, hemorrhoids, and many other maladies humans have suffered over the years. There is a museum, but I’ll have to refer you to your guidebook (I recommend those by Rick Steves) as I stayed outside since the weather was so lovely. These blue plants improve circulation and night vision. 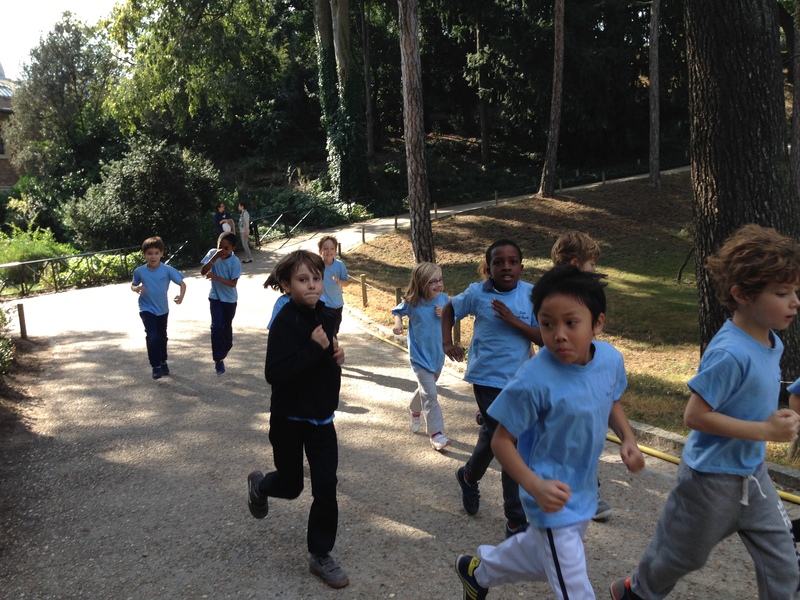 The teacher’s making us run! Run? Mais non! We are busy talking. Baby, grandmother, and tourists of course! 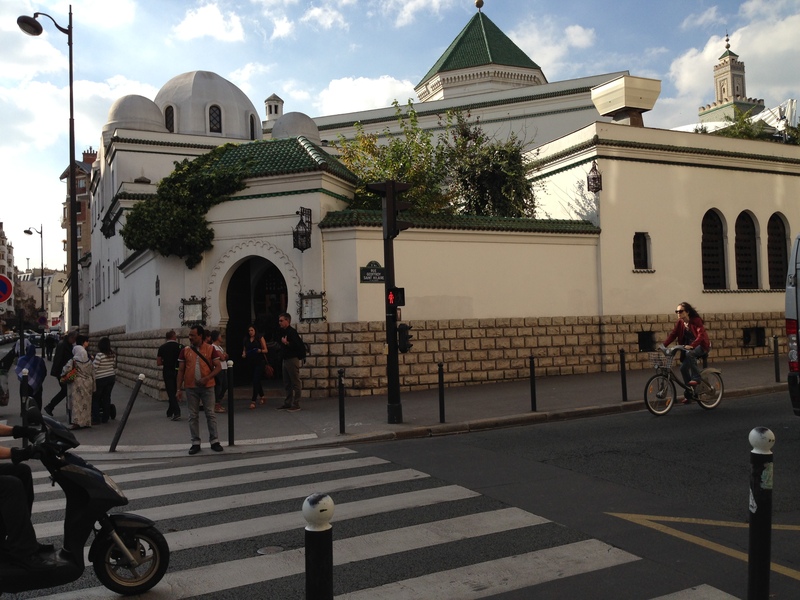 The exit from the park closest to the museum is across the street from the Mosque of Paris. The last mosque I visited was the Blue Mosque, in Istanbul, Turkey. Religious custom is strictly observed and the protocol for entering includes removing one’s shoes. As I expected the same here, I didn’t try to go inside. However, I did peek through the arched entryway that you see in the photo below. 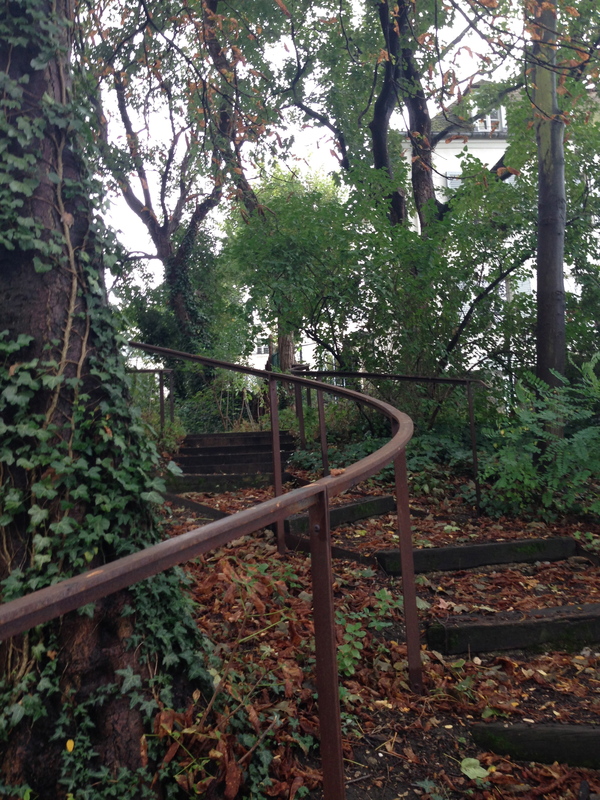 It leads to – a restaurant! 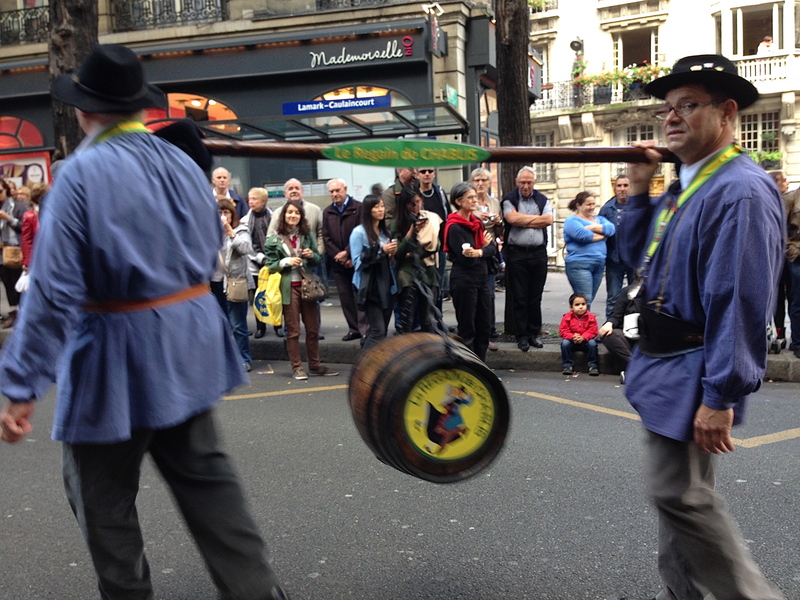 Well, this is France. C’est normale. One note about the rain in Paris: Woody Allen’s movie “Midnight in Paris” made the rain seem much more romantic than in reality. All the scenes with the beautiful French antiques dealer who becomes the main character’s love interest take place in a gentle drizzle. During the last three days it has rained quite hard here. Naturally, too, the actress playing the antiques dealer has straight hair that doesn’t frizz in the rain…sigh. Well, that film really is a fantasy. This entry was posted in Uncategorized on October 9, 2014 by Chrissygirl100. 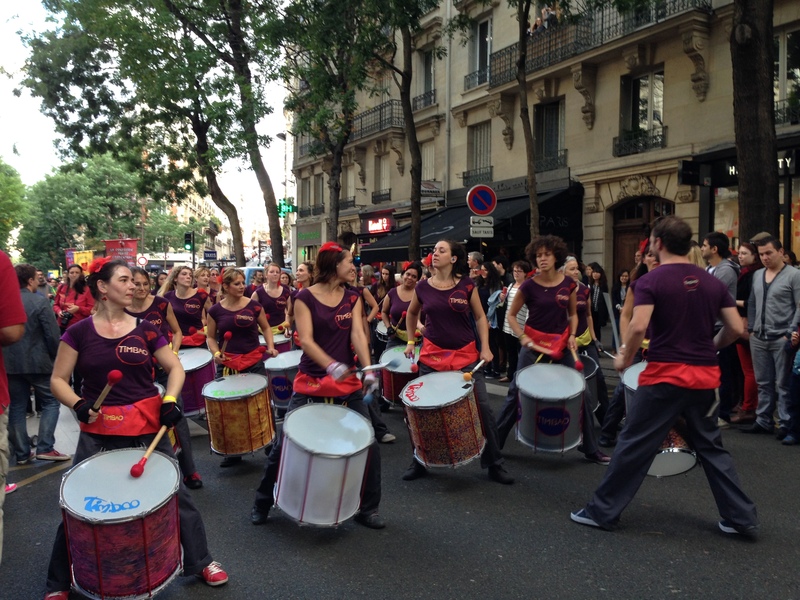 French – Yes, really! Everybody seems to speak very clearly. I would like to think that my comprehension has improved substantially. I am having a much easier time understanding and conversing, although of course there are always words that I have to search for not covered in the classroom. Most are on the practical side. For example “plug,” (for the sink), I learned from the young lady in the hardware store the word is “bouchon,” also used for the cork in wine bottles. The word for “chip,” as in the chip in European credit cards is “puce,” the same word for flea, as the man behind the metro station service window illustrated while scratching his shoulder. That chip, by the way, is a security device that American cards don’t have, and as a result machines in the metro won’t take your card and you, too, will need to speak with the person at the window. “Ail,” means garlic. I knew that, but since the fruit and vegetable vendor at the market reminded me of it I won’t forget it anymore. There is nothing like living where a language is spoken if you want to learn that language thoroughly. During the months since I left Paris last spring, I have been meeting weekly with a French conversation group whose members speak excellent French learned in places like Louisiana, Martinique, Switzerland and even England. My Canadian friend visited me in Washington recently and spoke lots of Québécois French to prepare me for my trip to France. Given the variety of regional accents I have been hearing, no wonder Parisian French is sounding like the equivalent of newscaster English to me! My apartment – bright and pleasant, and unlike the one I stayed in last winter it’s not in an area that the French would describe as “un peu chaud.” – literal translation: a little hot. The last apartment had one small issue I don’t think I mentioned. The view was of a “massage” parlor. While eating lunch one day and looking out my window I noticed only men knocking on the door of the business. That said, it was actually a very family oriented neighborhood with lots of kids and it was convenient to everywhere. However, I much prefer my view this time of trees and elegant haussmanian style apartment buildings. 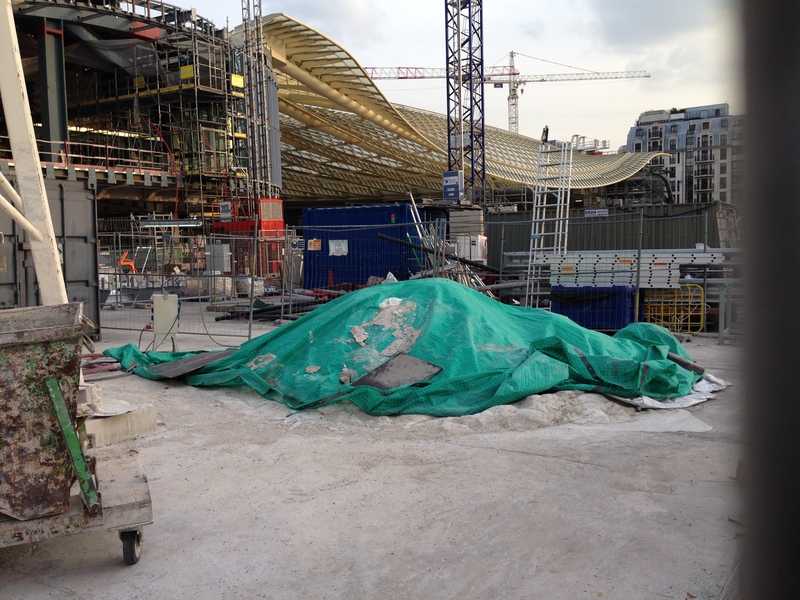 Les Halles – This formerly congested and unappealing area of the city is transforming. The new garden opened in early spring, and now a magnificent, undulating glass roof has been installed over the covered area of this city center. Here’s a snapshot taken through the wire fence surrounding the work site. 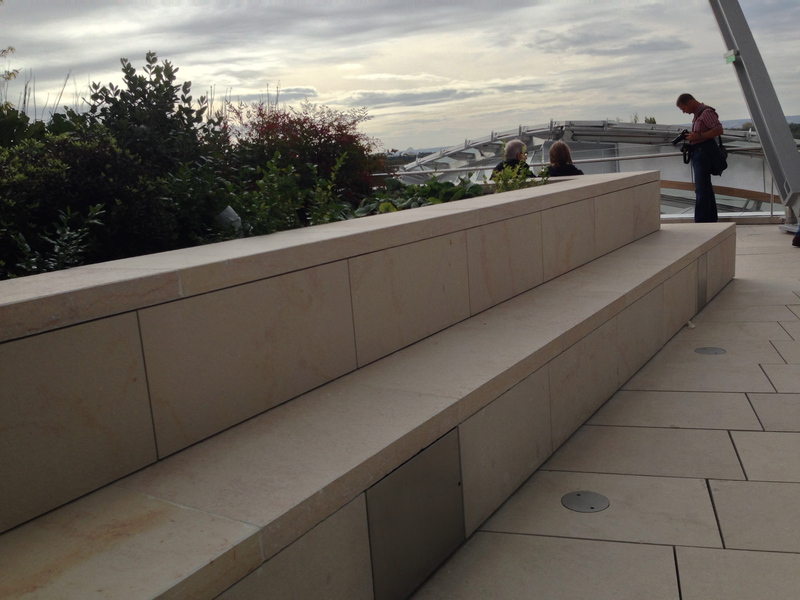 Visitors – Everywhere I travel in the city I am hearing much more English spoken than I did last winter. American and British tourists abound, followed by German speakers and those speaking various Asian languages. 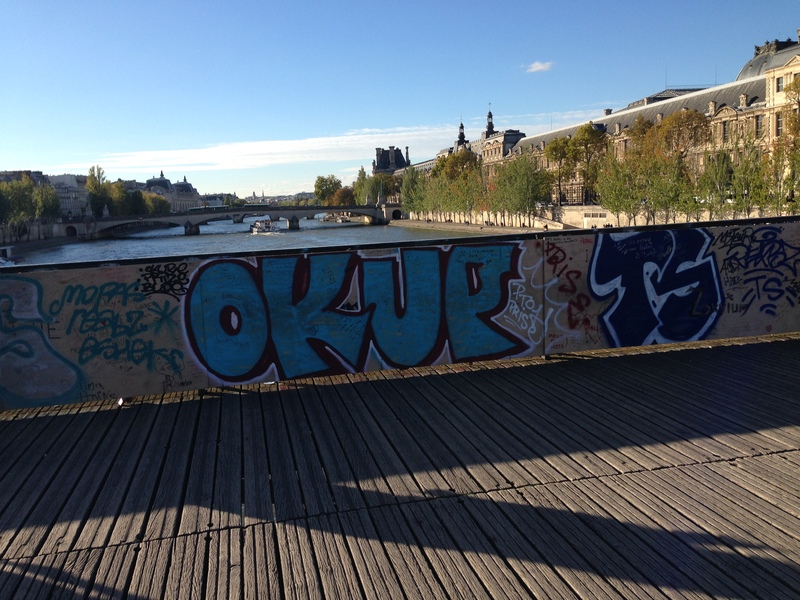 October is a popular time to come to Paris. 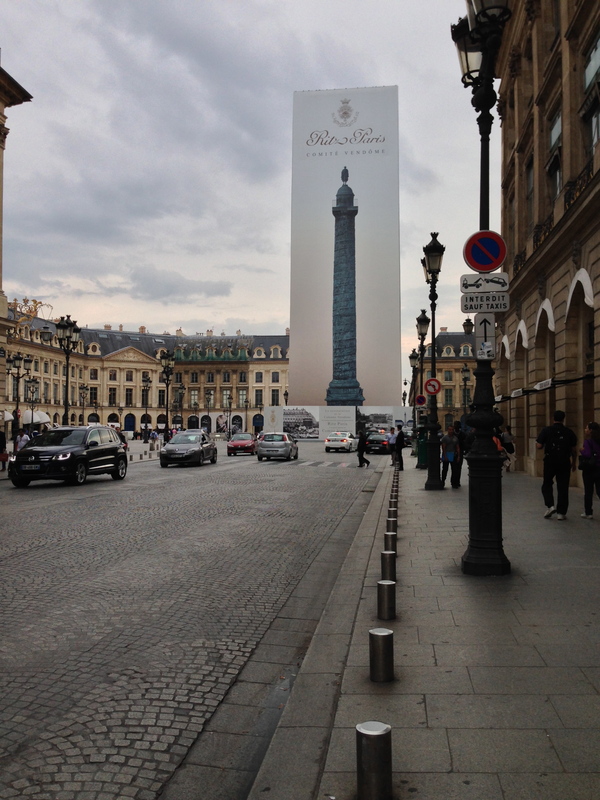 La Place Vendôme – If you saw the monument there last winter, lucky for you. It is now under restoration and is covered by a very striking banner. 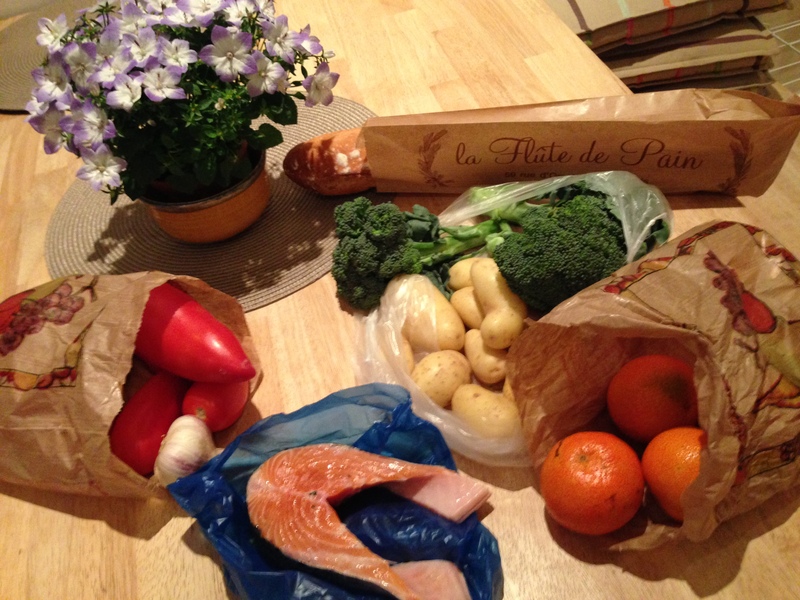 Groceries – I wandered around my neighborhood one evening looking for a Franprix or G20 grocery store, since I have their discount cards. 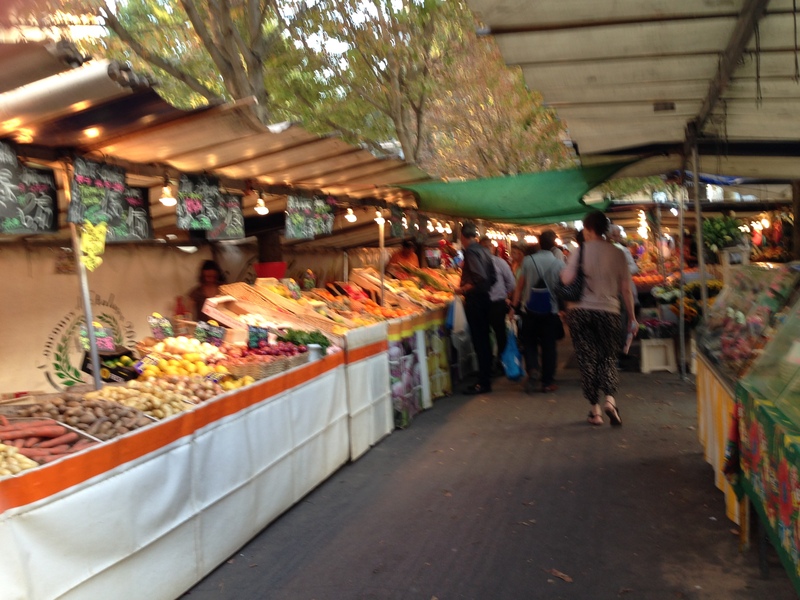 I did not find either one, but instead discovered this fantastic open air market. If you have seen the recent Helen Mirren movie “The 100 Step Journey,” it’s a twin to the market in that film. Bounty from the Market – Dinner was Great! Food, drink and talk – Some things never change. On a sunny day every square inch of sidewalk is filled with people enjoying each other’s company – all day long it seems. Good thing the weather is not that great or nothing would ever get done around here! This entry was posted in Uncategorized on October 5, 2014 by Chrissygirl100.